Saute zucchini & onion in lg. skillet until tender (& water cooked out)- ~10 minutes. Shortcut: I steam the zucchini and onion together (eliminating the olive oil and saute pan!). Stir in salt, garlic, oregano, parsley, pepper, & basil; cook one more minute. Add tomatoes. Coat pie pan w/nonstick cooking spray; pour mixture into pie pan. Bake for 18 to 20 minutes (or until knife test comes out clean). Let stand for 10 minutes before serving. Very important to be done, so it comes from dish easily. Preheat oven to 350 degrees. Pour oil into 8-inch baking dish and add one-third of the zucchini, Mozzarella, Parmesan, parsley and salt. Layer in this manner until all ingredients are used – cover with bread crumbs and dot with butter. Bake uncovered for 45-50 minutes. Really good! A few hours before preparing fritters, grate the zucchini and salt it and let set in a colander over a bowl to remove its water bulk. Squeeze even more water out when ready to prepare fritters. 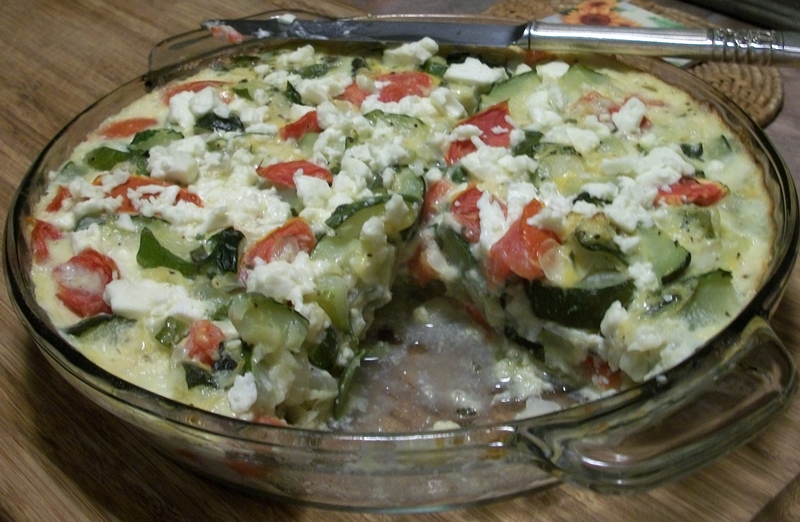 In a large bowl, whisk egg; add zucchini, garlic, onion, flour, panko, mint and Feta. Mix until well combined. Season with S&P. Heat oil in a large frying pan. Scoop two tablespoons of batter, flatten slightly and drop into the HOT oil. Cook on each side for about 4-5 minutes, until browned. Transfer to a plate lined with paper towel for oil to absorb. Serve with Tzatziki Sauce. These are FABULOUS! A few hours before preparing cakes, grate the zucchini and salt it and let set in a colander over a bowl to remove its water bulk. Squeeze even more water out when ready to prepare crab cakes. Mix all ingredients and form into patties. Fry in extra virgin olive oil or broil until light brown. These taste surprisingly like the “real thing”!